Automotive enthusiasts are ready for action as the 14th edition of the Dubai International Motor Show kicks off today at the Dubai World Trade Centre (DWTC). The five-day event will feature more than 100 global and regional launches, with a particular focus on electrification and autonomy, as Dubai focuses on its Autonomous Transportation Strategy and Clean Energy 2050 plan. In addition, more than 150 automotive manufacturers from every corner of the globe will roll into town to lure the visitors and serious car buyers. Autonomous and electric mobility leader, Tesla, will be present the show; while BMW, which launched its first connected car in 2002, will showcase its latest technology and future driving solutions. Since 2016, the German car giant has embedded a SIM chip in every model and has played a key role in facilitating the vision of connected, autonomous driving in the form of the BMW i Vision Future Interaction. Other manufacturers bringing the future of mobility to the show include Lexus and Jaguar Land Rover, whose 2018 Range Rover Sport will make its debut in the Middle East with its latest driver-assisted technology - the Touch Pro Duo infotainment system - described by its manufacturer as 'your twin high-definition touchscreen digital butler'. 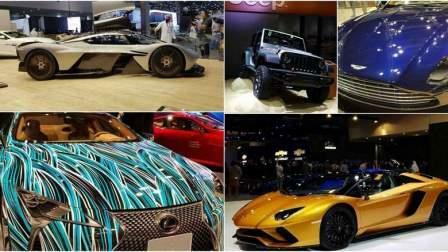 "As the Middle East's premier automotive event, the Dubai International Motor Show is the only place car fans, young and old, will get up close to some of the latest, glamorous cars set to be hitting roads around the world in the near future," said Trixie LohMirmand, SVP of Exhibitions & Events Management at DWTC. "However, what makes this year's show truly unique is that it goes far beyond the car. With so many visitor-focused activities, interactions and experiences throughout the five days, the 2017 Dubai International Motor Show promises to be a fun-packed, adrenaline-fuelled day out for the whole family." "Volkswagen is moving people forward; at the Dubai International Motor Show we are presenting the Arteon, a Gran Turismo fastback and the Teramont, our first seven-seater SUV," Andrew Savvas, brand director at Volkswagen Middle East, told Khaleej Times. "The Volkswagen BUDD-e, a futuristic concept model from the Volkswagen Group, will make its regional debut at the show; presenting an all-wheel electric drive built on the MEB platform, while the interactive and networked world of infotainment and mobility offers a clear view of the future." Toyota will also be at hand to showcase its 2018 Yaris Hatchback. Saud Abbasi, MD of Toyota at Al-Futtaim Motors, said that the vehicle is a hit in both retail and rental segments, thanks to its impressive fuel efficiency and compact size, and is one of the most comfortable cars for a city drive. Amongst the eye-popping, awe-inspiring reveals, Jeep will showcase its Grand Cherokee Trackhawk, the world's most powerful production SUV courtesy of its V8 engine, and Infiniti has chosen Dubai International Motor Show to unveil its new QX80 to the world. Debutants, Rimac, will display its electric Concept One supercar, and Italian company Icona has crafted a supercar from titanium - the Vulcano Titanium - which was inspired by the iconic SR-71 Blackbird - the world's fastest-ever aircraft. UAE brands Devel and Shaali Motor Sport will also be keen to show the emirates can make a noise in the supercar sector too, with their presence on the Boulevard of Dreams, the show's dedicated sector for supercars. Devel will unveil the production version of its Sixteen, which the manufacturer says produces an astonishing 5,000 horsepower. Meanwhile, luxury manufacturer, Rolls-Royce Motor Cars, will also unveil a special one-off commission - the Bespoke 'Spirit of Calligraphy' Ghost - a unique Extended Wheel Base Rolls-Royce Ghost that combines the words of the luxury brand's founder with the region's Arabian heritage. Tickets for the show are priced at Dh50 online on the event website and Dh65 on-site; VIP tickets are available at Dh250. Special packages are also available for groups and government employees.